Archimandrite Athanasios Mitilinaios, the New Chrysostom, as he is commonly called in the Greek spiritual circles, was born in the area of Athens, Greece. His family roots are from the beautiful Aegean island of Mitilini, as his last name suggests. Ordained at a young age, he preached incessantly from village to village where he was appointed a chancellor to the Metropolitan of Larisa. While teaching and illuminating great numbers of souls, Divine Providence would have him restore and revive the abandoned Monastery of Komnineiou and St. John the Theologian on the mountainside of Stomion overlooking the majestic Aegean Sea. The audio-cassette recordings of his teachings, some dating back to the early seventies, are circulating world-wide. One of these recordings fell in the hands of Mr. Constantine Zalalas in 1987, who was assisting Fr. Nicholas Kossis with the catechetical program in the Annunciation Church of Easton, PA. 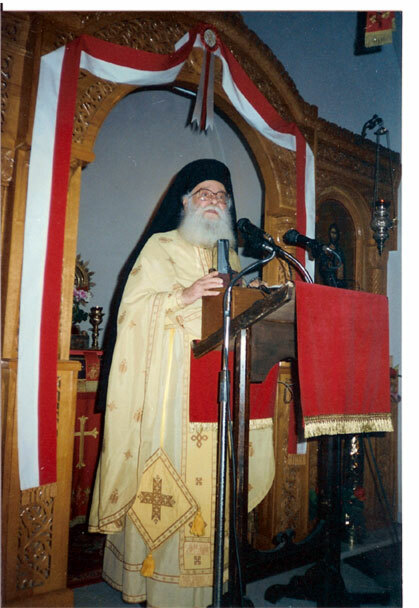 The following year, Sept. of 1988, Mr. Zalalas and Fr. 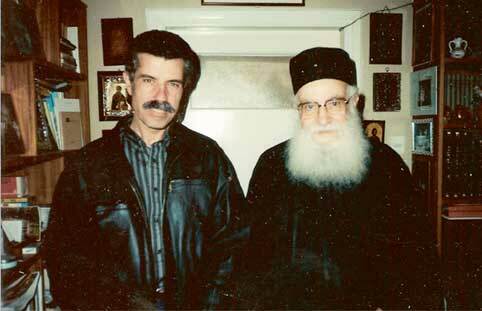 Nicholas met with the Elder Athanasios at his majestic monastery on the mountain slope of Kissavos in Stomion Larisa. At the end of his confession to the Elder, Constantine asked for a blessing to begin to bring this much needed spiritual nourishment to the English speaking world. The Holy Father's response, "I bless this with all my heart!" With the Elder's blessing the audio department of Saint Nikodemos Publication Society has distributed over 50,000 tapes, over 180 different topics about our Orthodox Faith. Thousands of these cassettes and CDs have also been distributed by our monastic communities and church bookstores, independently. 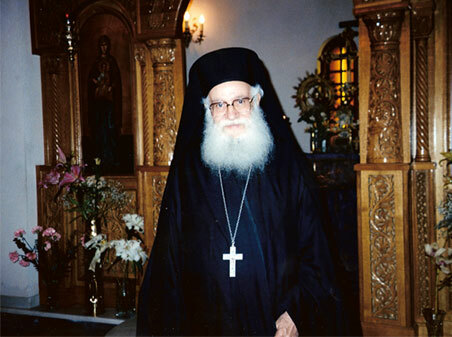 At least 90% of Mr. Zalalas recordings, translations, adaptations, and lectures are primarily centered on the Greek recordings of the indefatigable "new Chrysostom Elder Athanasios Mitilinaios". Mr. Zalalas, who resides in Bethlehem PA with his family has been meeting with the Elder almost every year and has been advised by him regularly over the phone for the last 18 years. On May 23, 2006, the Elder slept in the Lord after a lengthy illness. May his memory be eternal. 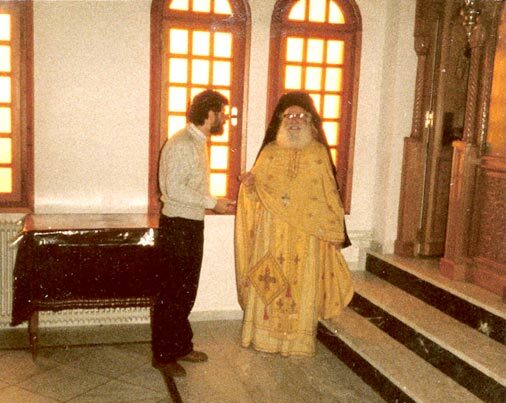 He has left us with 8,000 recorded lectures, imbued with the aroma of patristic traditional Orthodoxy. May we have his Blessing! The first meeting with the elder: September 25, 1988. 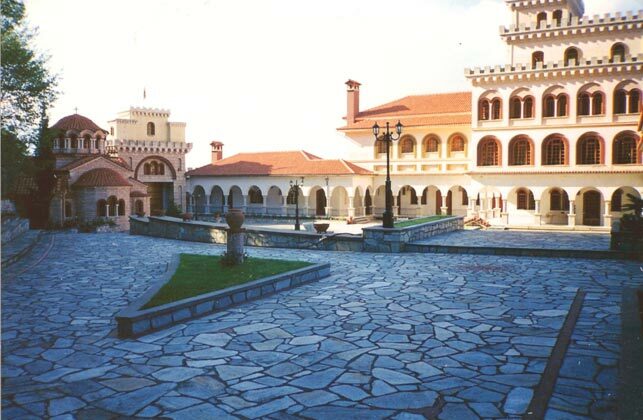 The Monastery of St. Demetrios. The elder while praying heard a voice, "I will give you a spirit of architecture"! The entire monastery was designed by the elder and completed primarily by the monks.